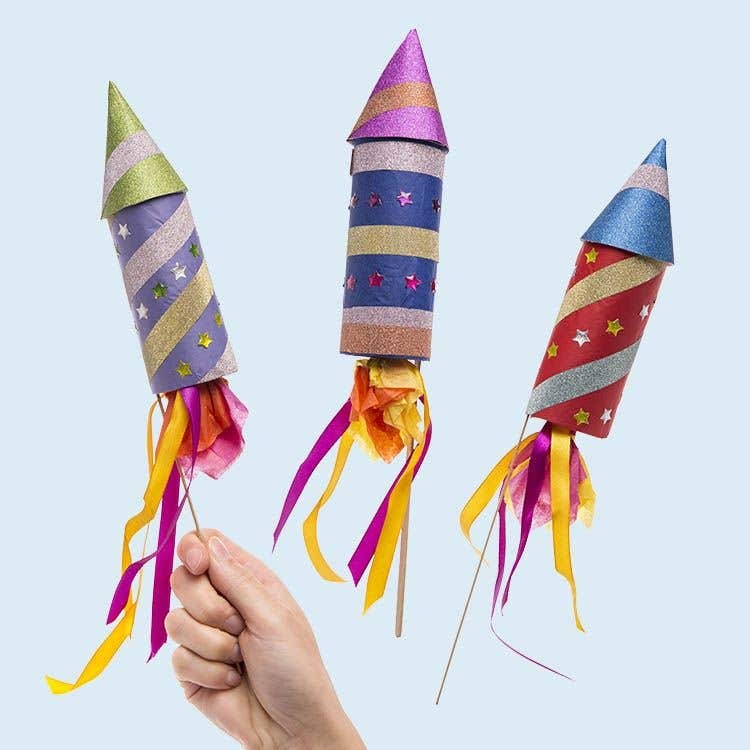 These sparkly rockets can be filled with surprise sweets and other treats. They make perfect party favours, decorations or party crackers. Brush a small amount of glue inside a cardboard tube at both ends. Wrap a 30cm x 30 square of coloured tissue paper around the tube. Tuck the ends inside the tube over the glue. Cut out a 12cm diameter circle from glitter card then cut it in half. Curl one of the card semi-circles into a cone shape then staple it along edge hold the shape. Glue the cone onto one end of the tube to make a rocket shape. Glue one end of a wooden stirring stick inside the rocket. Leave to dry. Stick strips of glitter tape around the rocket cone and tube with some crystal sticker stars as decoration. Cut 2 x 30cm x 30cm squares of tissue, place the squares together with some small sweets in the middle. 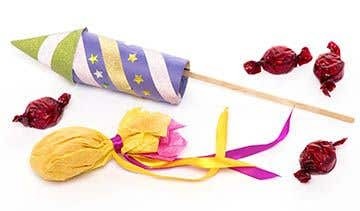 Pull the tissue paper over the sweets then twist it to make a parcel. 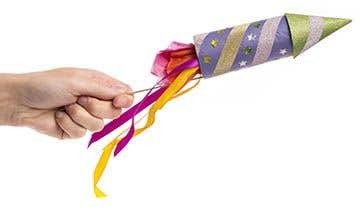 Tie pieces of ribbon around the end of the parcel then push it inside the rocket. 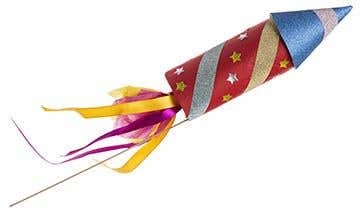 Try adding cracker snaps to the rockets by glueing the ends inside the tube, leaving a section outside so it snaps as you pull it with the ribbons.